Duracell has really outdone itself on the warm-fuzzies front. They’ve ventured into pink-fuzzies territory. Aside from sporting bright red clown noses, these little guys look almost identical to marshmallow peeps (not the chicks or the pumpkins or the Christmas trees…you know which ones I’m talking about). Anyway, one bunny is cute; but watching thousands of them band together to make larger, more formidable creatures is downright delightful. 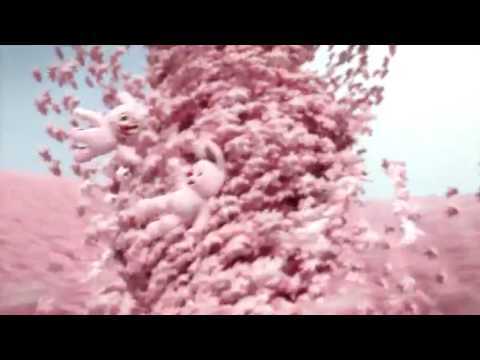 Oh, you can thank advertising agency Ogilvy Paris for this gem of a commercial. 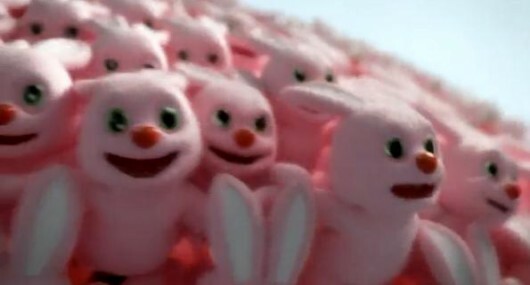 Too bad we can’t enjoy the Duracell bunny here in North America thanks to copyright issues. Damn you, Energizer Bunny! Found your site from a friend’s Facebook link, it seems that you have growing fanbase and I now undertsand why… Keep the quality articles coming, thanks a million. I’d have to be of the same mind with you one this subject. Which is not something I usually do! I really like reading a post that will make people think. Also, thanks for allowing me to speak my mind! Hands down the best post on this on the web. I’ve been scouring for months and this takes the cake. Got certain helpful and applicable ideas on this article. Scouting around literally help a lot in locating ideas and i am amazed that the web have evolved while conducting a searches today. Truly suitable content I need for my analysis, as a student is not an easy job. I’ve got to make it decent or I’ll get kick out. Have a pleasant day and Many Thanks. This is my first time I have visited your site. I found a lot of interesting stuff in your blog. From the volume of comments on your articles, I guess I am not the only one! keep up the great work. I’ll come back to check it again, thanks for your post. Very good information and facts, many thanks to the article author. The idea is perplexing to me today, however in general, the effectiveness and relevance is overwhelming. Really very much thanks once again and also best of luck! I am a Boston Taxipilotand I was doing a research for the keyword Boston Taxi when I found this blog. I must admit I revere the principals you have shared with us and look forward to swingiing by again and more. Nice article, thanks! I really love it. The writing is indeed interesting. It feels nice reading a piece of writing as educational as this. I got a lot of delightful thoughts here. You are a good writer to come with writing information that possibly will inspire as well as benefit a lot of your visitors. I will visit this blog more regularly. Unusual… I just stumbled on to your blog by looking for “South Park figures”‘ on Yahoo. But I can’t find any articles on that topic on here? Sadly,I couldn’t see the image for this post. It seemed like the HTML code was broken. A mi el tarot me ha da resultdos. Nunca mejoraras. Arregla tus situaciones, nunca te des por vencido. Buena Suerte. Una vida estable te espera. A mi el tarot me ha da resultdos. Desde hoy sera igual. Arregla tus situaciones, nunca te sometas. Buena Suerte. Una vida espectacular te espera. Thanks for taking the time to write this article. It is always fun to read someones perspective. I need to make some time to come back and read the otherof the site. thanks. What a fantastic post! Thanks for sharing it on your blog. A mi el tarot me ha ayudado. Nunca mejoraras. Soluciona tus problemas, nunca te sometas. Una vida mejor esta aguardandote. How is it that just anybody can write a blog and get as popular as this? Its not like youve said anything incredibly impressive –more like youve painted a pretty picture over an issue that you know nothing about! I dont want to sound mean, here. But do you really think that you can get away with adding some pretty pictures and not really say anything? Thank you for this excellent site. I sincerely preferred reading through it and ought to share it with folks.